Posted on July 24, 2013 by Susan H.
Michael chose Mint as his second flavour to try in the ice cream machine. He originally chose Mint Chocolate Chip, but changed his mind just as I was about to add in the chocolate chips in the last 5 minutes of ‘churning’. I think Michael preferred to enjoy the creamy minty texture all on its own. I don’t blame him…rich, creamy and oh so minty…Andy, my mother, nephew Lukas and I can all attest to loving this flavour. I think crushed candy canes would be a perfect addition…my favourite flavour at Howard Johnson’s was always Peppermint Stick Ice Cream. 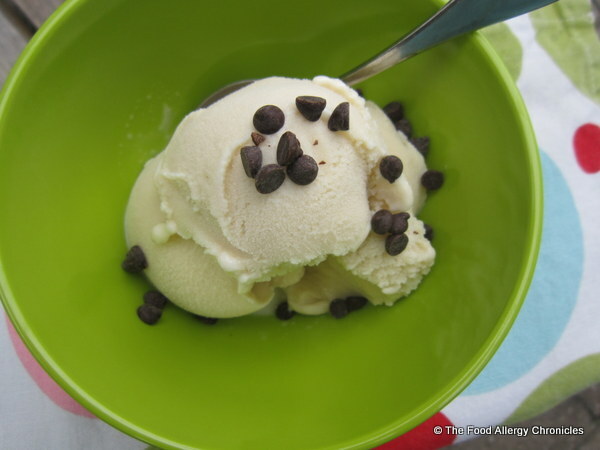 …just sprinkle a few chocolate chips on top or mix them in to the softened ice cream. 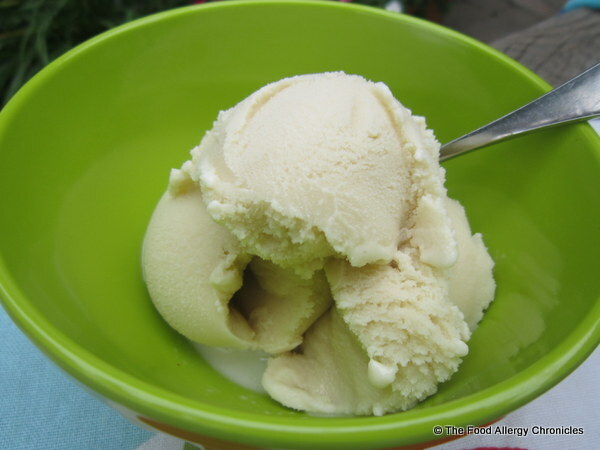 Follow Allergic Living Magazine’s Senior Editor Alisa Fleming’s Summer 2013 Edition recipe for Dairy, Egg and Peanut/Tree Vanilla Ice Cream. Omit the vanilla and replace it with 1 tsp peppermint extract. Add in with the 1/4 tsp salt in the recipe. 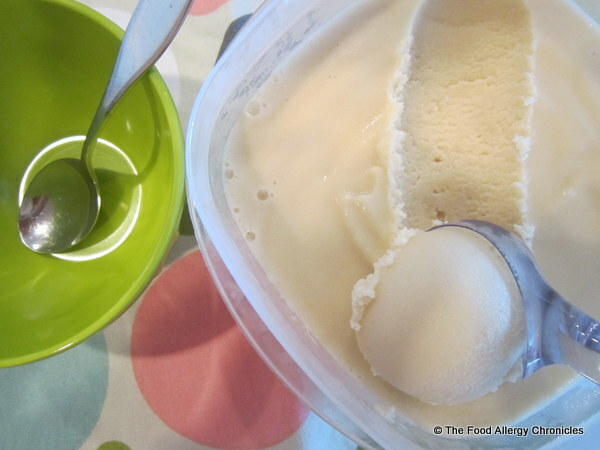 Click here for the recipe on my post on Dairy, Egg and Peanut/Tree Nut Free Vanilla Ice Cream. A Dairy, Egg and Peanut/Tree Nut Free Brownie topped with Dairy, Egg and Peanut/Tree Nut Free Mint Ice Cream drizzled in Dairy Free Chocolate Sauce. Click here for a recipe for Dairy Free Chocolate Sauce and here for Dairy, Egg, Soy and Peanut/Tree Nut Free Brownies. P.S. Next up…Michael wants to try Butterscotch…this could take some figuring out. 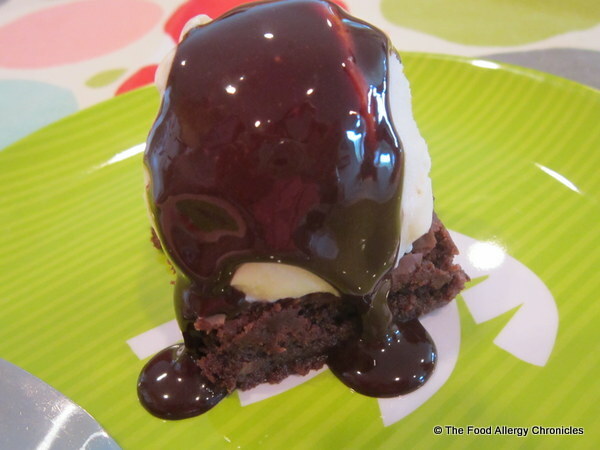 This entry was posted in allergies, dairy free, dessert, egg free, Gluten free, Ice Cream, multiple food allergies, peanut/tree nut free and tagged allergic living magazine, Dairy Egg and Peanut/Tree Nut Free Mint Ice Cream, Dairy Egg Soy and Peanut/Tree Nut Free Brownies, Dairy Free Chocolate Sauce by Susan H.. Bookmark the permalink. I loved that Howard Johnson’s flavor too! I had no idea ice cream machines worked so well…it all looks wonderful.